Thank you for taking the time to review the proposed plans for the redevelopment of 1 Tile Cross Road, Birmingham. 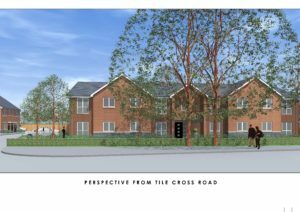 Brooke Smith Planning (Arcadis) has been appointed by Bromford Housing Association Ltd. to pursue the preparation of a planning application for demolition of the existing building on site, and the construction of 15 extra care apartments and 3 two bedroom homes. The final proposals are a work in progress, and we therefore welcome any comments you may have to help shape the proposals. The existing building on site is situated in the centre of the site, towards its northern boundary with Tile Cross Road. The property is largely two storeys in height, with a single storey outbuilding/garage attached. Two additional flat roofed outbuildings are located within the rear garden. The current building is relatively dated and unattractive, providing an ideal opportunity to develop a high quality residential led scheme in this accessible area of east Birmingham. The proposed development will be split into two elements. 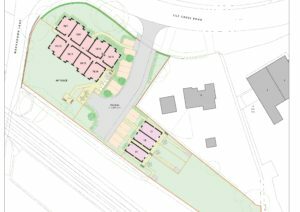 Three, two bedroom dwellings will be located within the southern extent of the site, whilst 15 assisted living ‘MyPlace’ apartments will be located within the north of the site, replacing the existing building. MyPlace accommodation provides residents with learning disabilities the opportunity to live independently, harness opportunities and reduce dependency, whilst being supported by an element of on site care. Residents living in a MyPlace property will have their own apartment to enable them to live independently, but they will also benefit from the use of a resource hub, comprising a lounge, meeting room and kitchen to provide a social area for residents, their friends and family to enjoy. Bromford provide a housing specialist who will visit site to assist residents with support in terms of maintaining the home, organising repairs and managing visitors etc. This proposal is considered to provide a long term viable use for the site, proposing mixed tenure residential use in an area that is close to public transport links, schools and businesses. The proposal includes off-road parking, cycle hoops and green space for residents to enjoy. Vehicular access into the site is proposed to be from Tile Cross Road, replacing the current access, in order improve highway safety in the area. It is intended that there will be 7 car parking spaces dedicated to the MyPlace element of the scheme, whilst the three market dwellings will benefit from two parking spaces per dwelling. Thank you for taking the time to look at the proposed scheme. We welcome any comments you may have, to help shape the final proposals. If you would like to share your views, please complete the attached questionnaire, which will be taken into account when preparing the final submission. Please note, this consultation period will close on 22nd December 2017.